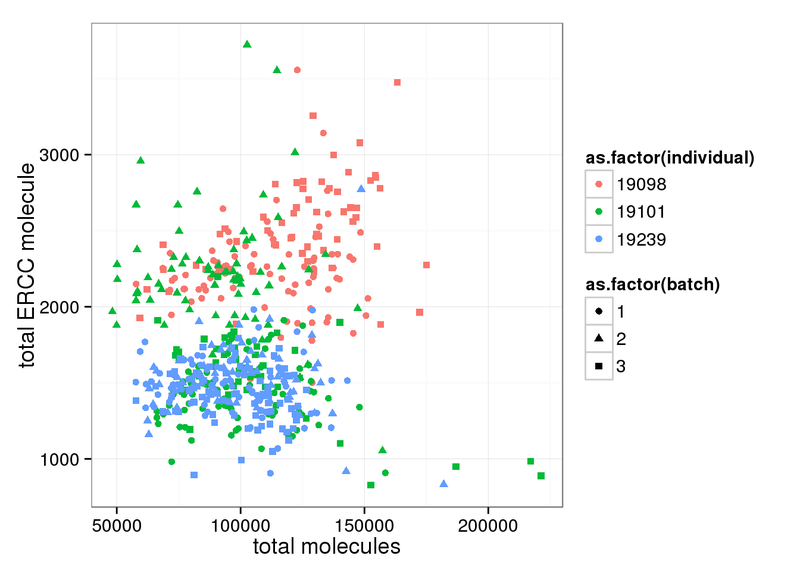 We standardize the molecule counts to account for differences in sequencing depth. 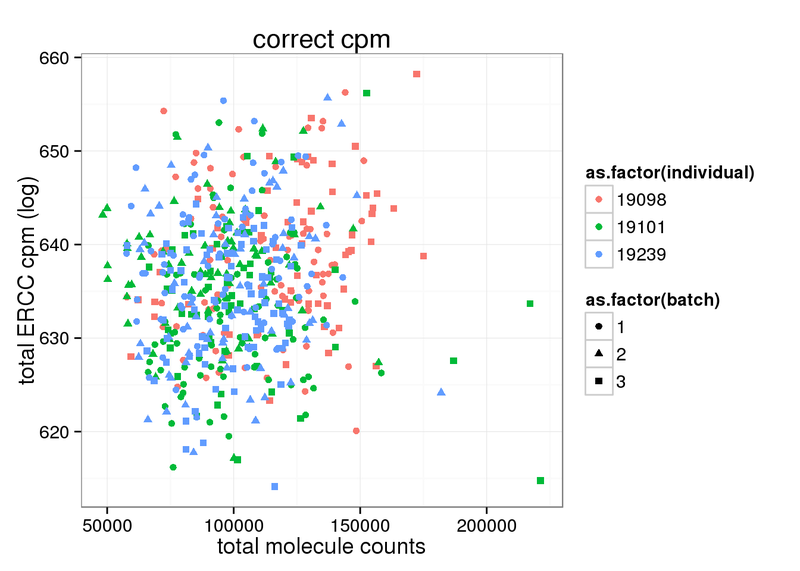 This is necessary because the sequencing depth affects the total molecule counts. 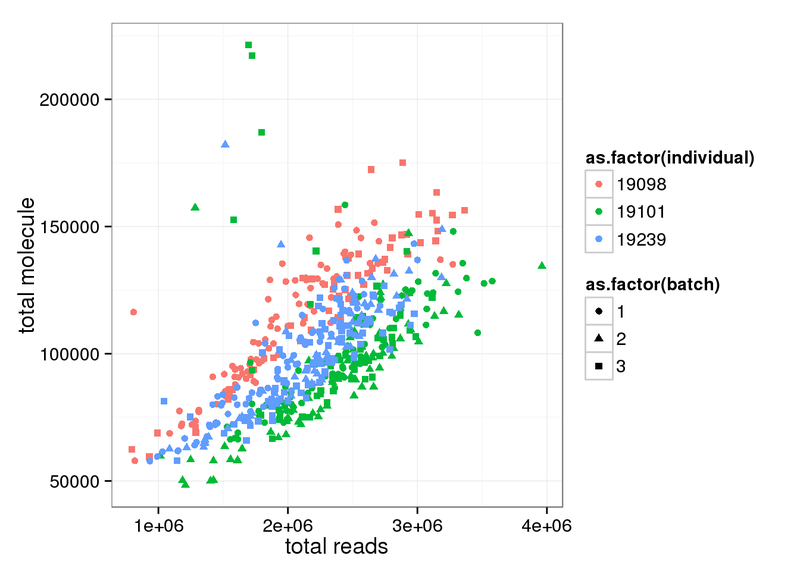 However, according to our study design. 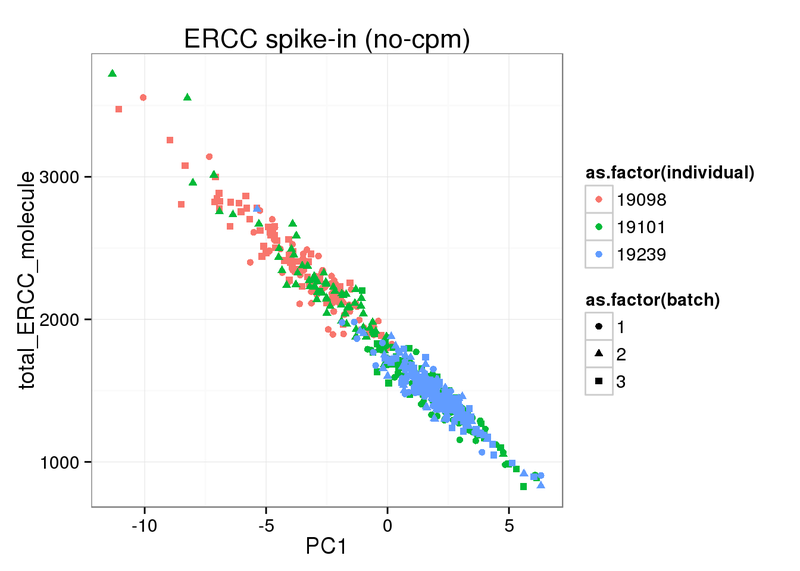 Each cell within the same C1 patch, independent of total number of transcripts, should have equal amount of ERCC molecule. 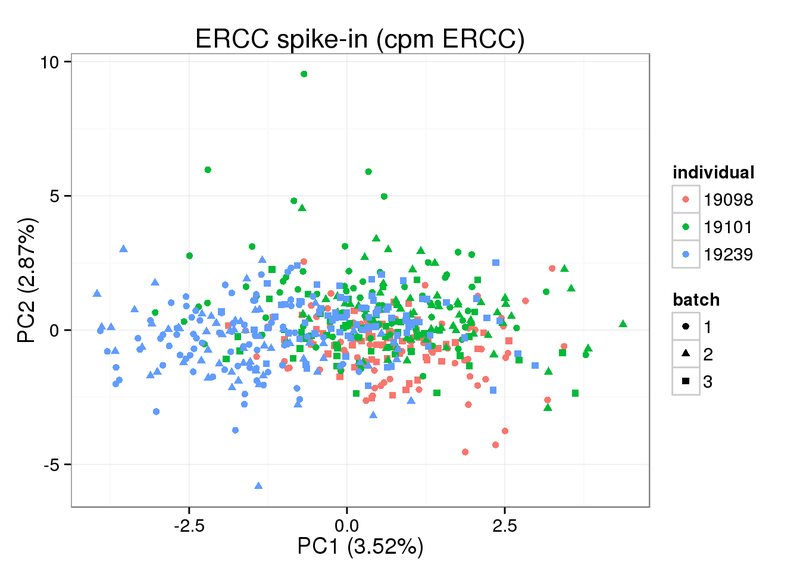 As a result, cpm (no log transforamtion) will introduce bias to ERCC, where cells with more molecules will end up with fewer ERCC molecules. 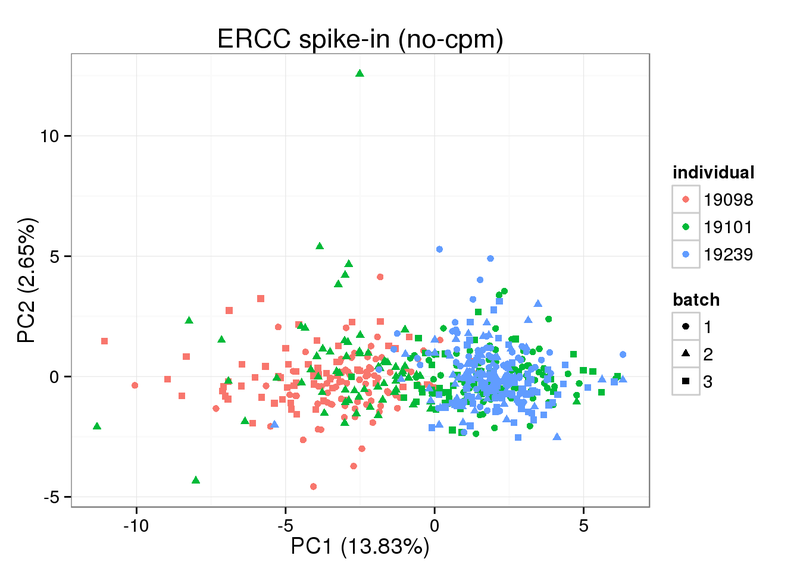 Therefore, cpm should not be performed on ERCC genes, but only on endogenous genes. 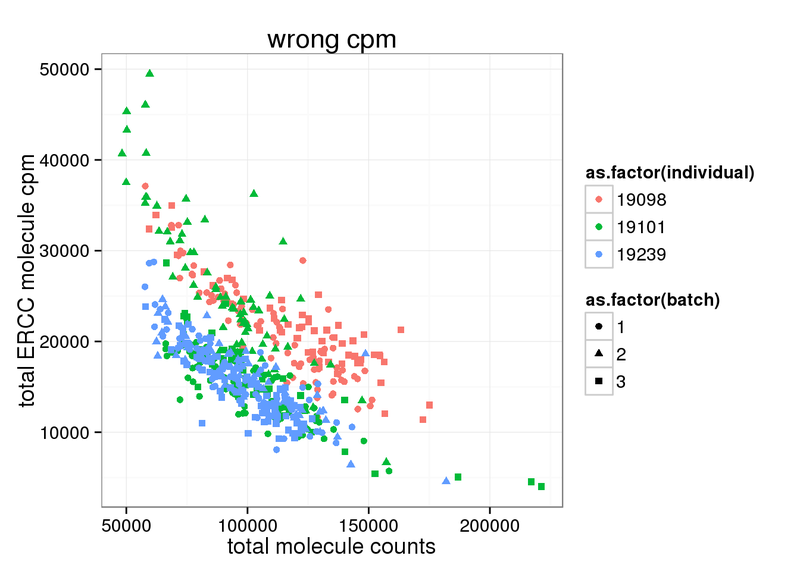 Number of total molecule correlates with total read number. 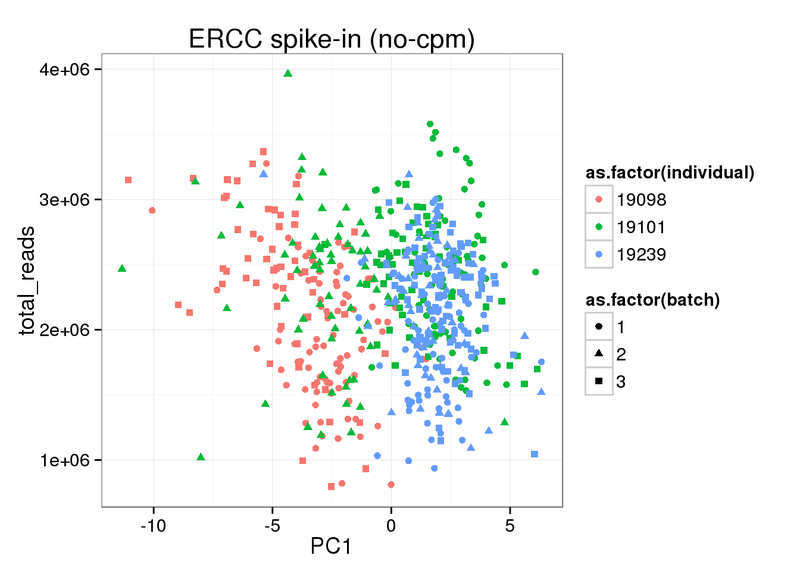 Look at ERCC and endogenous gene separately. 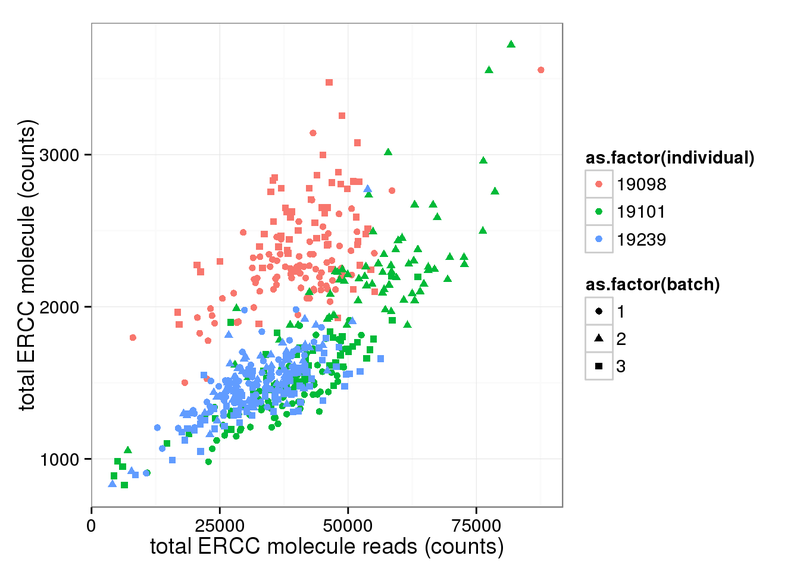 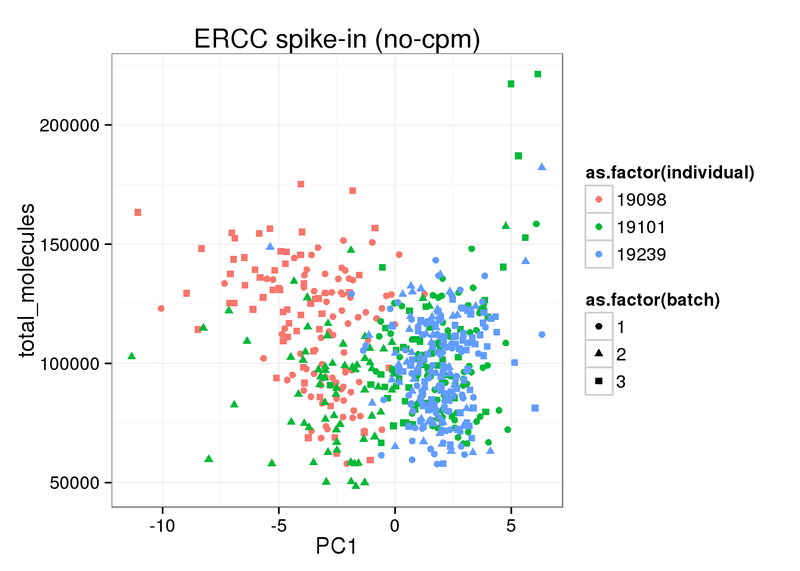 * Total ERCC molecule counts is independent on total reads, total moleceuls, or total gene molecule counts * Total ERCC molecule counts show (surprisngly) individual effect, where 19098 have more and 19239 have fewer. 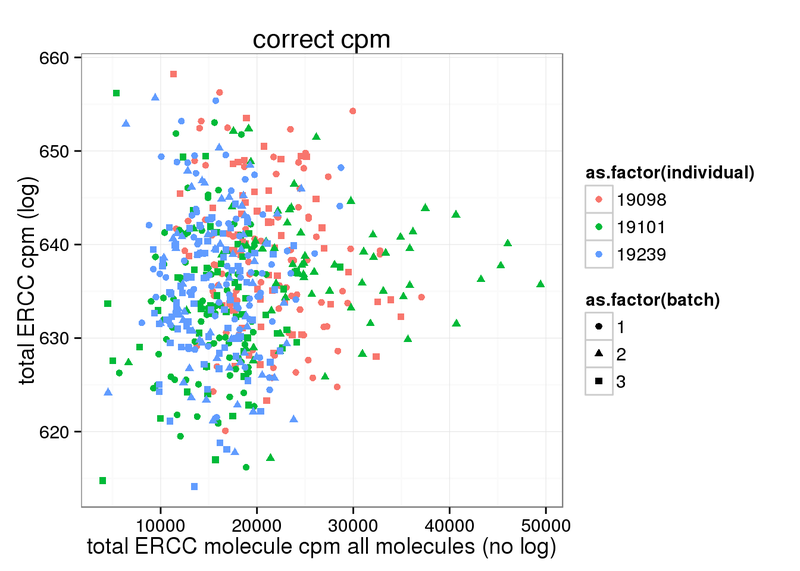 After cpm, total ERCC molecule number is no longer independent on total molecule counts. 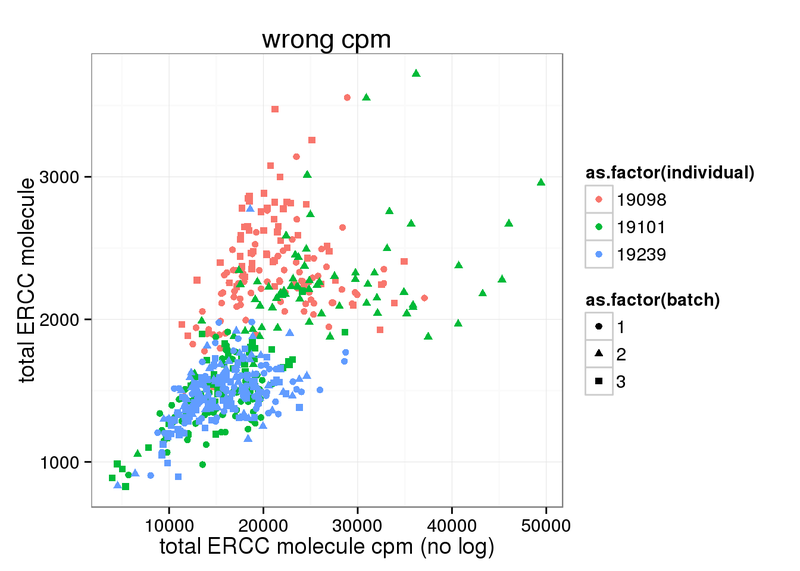 cpm of ERCC should be perfomed seperated. 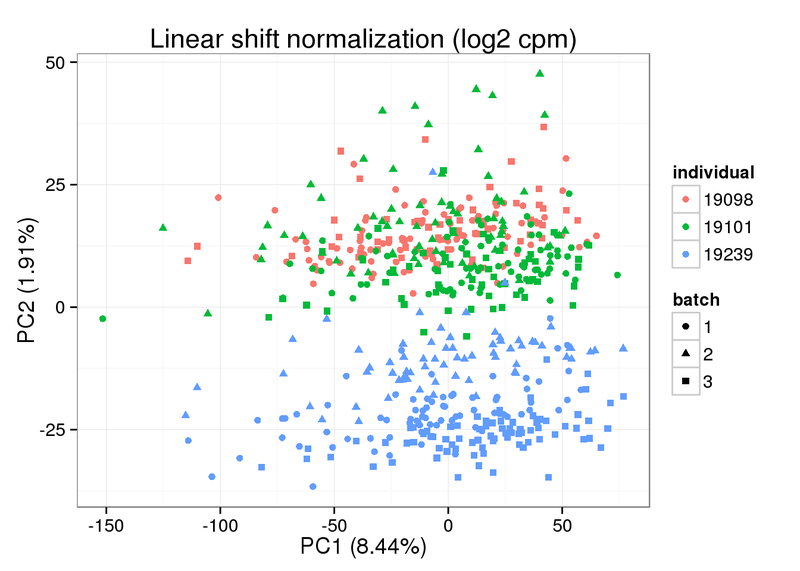 Try the linear shift normalization after cpm ERCC separately and then use the method linear shift normalization. 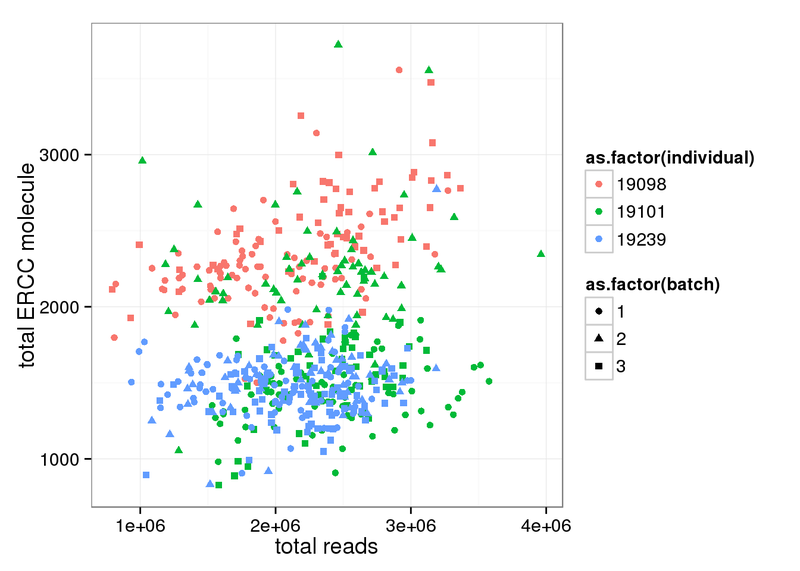 There is error in the original r code. 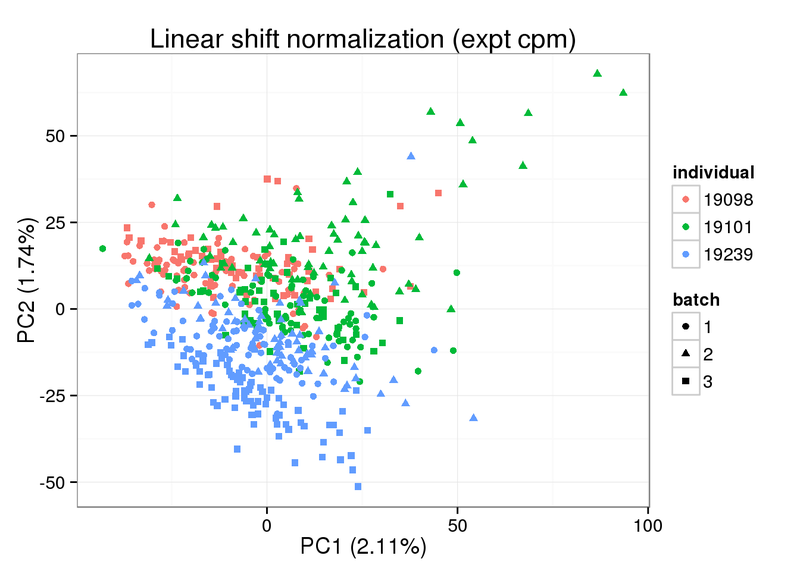 It shoud be Y = mX + b -> X = (Y - b) / m instead of Y = mX + b -> X = (Y + b) / m. After the shift, take exponential to get non log transformed value.